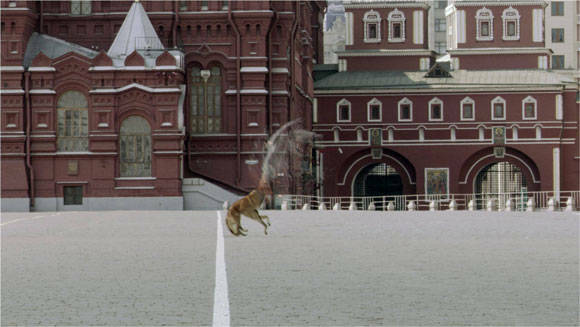 Essential plot rundown: A group of Americans fight against invisible aliens in Moscow. I'll just tell you up front: this is not a well made movie. Slightly entertaining, yes; well made, no. This move didn't have anything going for it. This movie takes place in Moscow. Why? Cuz why not? There is no reason for them to be in Moscow, other than it's something different and exotic. Actually, that was the main reason that I wanted to see it. I spent four months last year in Russia. 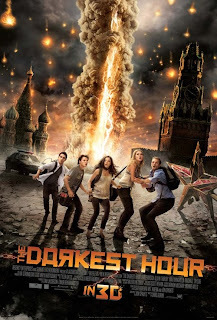 I got to spend some time in Moscow and The Darkest Hour was released shortly after I got home; so I was interested to see those places on the big screen. But it didn't add to the story at all. Also, the whole beginning exposition was lame. It explains who they are and why they are in Moscow. But, once again, it doesn't add to the story. It was like this happened in pre-production: Head honcho walks into conference room. "Ok, we want this movie to take place in Russia. But we want American characters. The first person to come up with a reason explaining why they are there will get $5." After 10 seconds, somebody raises his hand and they use his idea. They should've just made them tourists. (While cliché, I feel it would have made more sense). So, the characters get a lame introduction in the beginning. And that is the extent of their character development. Not once did I care about these guys other than the fact that Natalie was really cute. Some characters die, but I never really cared. Nothing up on the screen--characters or story--had me engaged. The characters were flat, the plot unoriginal. Hell, this isn't even the first time that aliens disintegrate people (War of the Worlds and Transformers: Dark of the Moon). Speaking of aliens, they were pretty dumb too. The fact that they were invisible was kind of cool. But the heros discover a way to sense them really quickly and that's never a problem during the rest of the movie. The aliens (when briefly shown) look really stupid. They looked like Pokémon trapped inside of those gyroscope toy things. So, overall, it is a slightly below average movie. There's nothing good about it. But it isn't painful to watch. Yes, that pretty much describes it.